Matrix quantum mechanics offers an attractive environment for discussing gravitational holography, in which both sides of the holographic duality are well-defined. Similarly to higher-dimensional implementations of holography, collapsing shell solutions in the gravitational bulk correspond in this setting to thermalization processes in the dual quantum mechanical theory. We construct an explicit, fully nonlinear supergravity solution describing a generic collapsing dilaton shell, specify the holographic renormalization prescriptions necessary for computing the relevant boundary observables, and apply them to evaluating thermalizing two-point correlation functions in the dual matrix theory. S. Lin and E. Shuryak, Toward the AdS/CFT gravity dual for high energy collisions. III. Gravitationally collapsing shell and quasiequilibrium, Phys. Rev. D 78 (2008) 125018 [arXiv:0808.0910] [INSPIRE]. D. Kadoh and S. Kamata, Gauge/gravity duality and lattice simulations of one dimensional SYM with sixteen supercharges, arXiv:1503.08499 [INSPIRE]. J. Maldacena, D. Stanford and Z. Yang, Conformal symmetry and its breaking in two dimensional nearly anti-de-Sitter space, Prog. Theor. Exp. Phys. 2016 (2016) 12C104 [arXiv:1606.01857] [INSPIRE]. 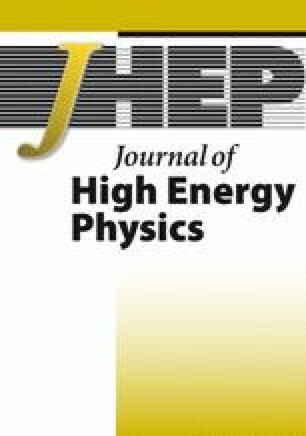 D. Grumiller, J. Salzer and D. Vassilevich, Aspects of AdS 2 holography with non-constant dilaton, arXiv:1607.06974 [INSPIRE]. Y.-Z. Chu, TensoriaCalc package for Mathematica, http://www.stargazing.net/yizen/Tensoria.html. K.D. Kokkotas and B.G. Schmidt, Quasinormal modes of stars and black holes, Living Rev. Rel. 2 (1999) 2 [gr-qc/9909058] [INSPIRE].